My fruitcake-disliking husband bought the Robert Lambert Winter Fruitcake for me for my birthday. At $55 for one small cake, this is quite a statement of love. 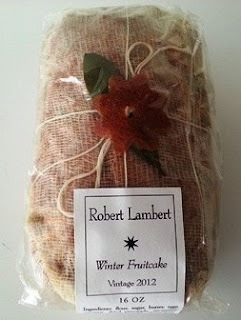 As you all know, I really enjoyed the white fruitcake that Robert Lambert makes, so was intrigued to see if there was an appreciable difference. I had recently re-tasted the white at the fruitcake tasting a little while back, so the memory was still fresh in my mind when I cut into this one. The difference between this cake and the White is that it focuses primarily on dried fruit except for glacéed apricots, and also includes tropical fruit juices, cardamom, and cinnamon. Perusing the ingredient list, that juice is guava/peach, and the dried fruit are pineapple, nectarines, and cherries (as well as white raisins). You have quite a few different peels in this cake: Rangpur lime, Meyer lemon, blood orange, and grapefruit. Just as with the White, there is coconut, which adds a distinctive flavor and texture (some might call it hairy but it doesn't bother me). Four kinds of nut: pecans, almonds, walnuts, and Brazil nuts, the latter chopped rather largely. By the way, I have been corresponding with Robert and he said that he often will blanch his walnuts as a way to remove a bit of that bitter taste you can sometimes get from that nut. So bakers, take note. And on to the taste: delicious. This one might even beat the White cake, in my opinion, because of these delicious pops of acidic freshness you get from the dried cherries and that tropical juice. My fruitcake-disliking husband even tried a bite and agreed that it is a tasty breakfast quick bread. The crumb is very much a poundcake-like crumb, rather moist and with a non-cloying sweetness. I tried a slice of this in a fruitcake duel this morning with a slice of the Heritage Baking cake, which is also hanging out in my fridge, and the difference in sweetness is pronounced. The Lambert cake has a good balance of cake, citrusy and nutty notes, as well as the zing from the dried fruit and richness from the coconut. The Heritage Baking, on the other hand, has a very classic rich, syrupy, buttery sweetness, almost like pancakes with syrup. Neither were bad, just very different one from the other. This very well might be my new favorite. 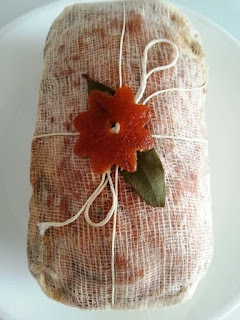 A definite good one for foodies and someone who thinks that all fruitcakes are the same. A delicious holiday breakfast treat. But NOT for someone who is looking for the classic fruitcake taste. 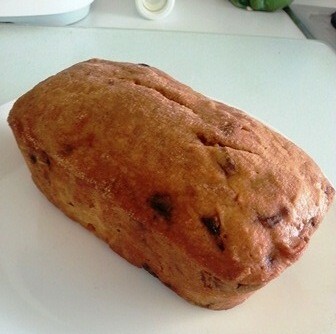 This almost looks like the best fruit cake I had for my birthday. It looks quite delectable. I should probably go home and eat some now.